The global cancer biomarkers market is highly fragmented in nature with a large number of players and a high level of competition, states a new market research study by Transparency Market Research. The rising research and development activities and the growing focus on technological developments are estimated to encourage the growth of the global cancer biomarkers market in the next few years. In addition to this, the rising number of mergers and acquisitions and collaborations and the expansion of the product portfolio are some of the other key factors that are predicted to support the growth of the overall market in the next few years. Some of the key players operating in the cancer biomarkers market across the globe are F. Hoffmann-La Roche Ltd, Genomic Health, Illumina, Inc., bioMérieux SA, Thermo Fisher Scientific Inc., Agilent Technologies, Hologic, Inc., Novartis AG, QIAGEN, Merck & Co., Inc., and Abbott Laboratories. As per the research study by Transparency Market Research, in 2016, the global cancer biomarkers market was worth US$ 10.25 bn and is projected to reach a value of US$ 27.63 bn by the end of year 2025. The market is likely to register a promising 11.80% CAGR between 2017 and 2025. 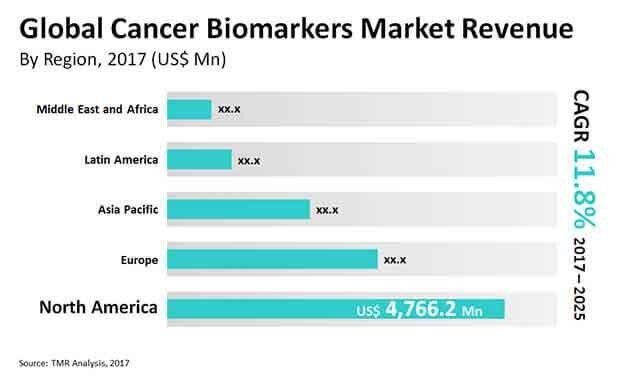 The global market for cancer biomarkers has been classified on the basis of geography into the Middle East and Africa, North America, Latin America, Europe, and Asia Pacific. Among these, North America is predicted to account for a large share of the market and remain in the leading position in the next few years. The high growth of this region can be attributed to the rising prevalence of cancer and the rising health care expenditure. In addition to this, the growing demand for enhanced diagnostic tests and the health care services and technological advancements are some of the other key factors that are predicted to enhance the growth of the overall market in the next few years. On the other hand, Asia Pacific is estimated to register a healthy growth rate in the coming few years, thanks to the rising awareness among people regarding good health. Moreover, the rising geriatric population and the rising disposable income are further projected to drive the Asia Pacific market in the near future. The global cancer biomarkers market has been categorized into disease indication into blood cancer, stomach cancer, liver cancer, lung cancer, ovarian cancer, melanoma, colorectal cancer, breast cancer, and prostate cancer. Among these, the lung cancer segment is predicted to lead the market in the coming few years, owing to the rising prevalence of lung cancer, especially in emerging economies. Moreover, the rising cigarettes smoking, the rising geriatric population, and the increasing technological advancements are estimated to accelerate the growth of the global cancer biomarkers market throughout the forecast period. The rising incidence of cancer and the rising research on cancer biomarkers are considered as some of the key factors that are projected to encourage the growth of the cancer biomarkers market in the next few years. In addition, the rising use of cancer biomarkers in drug development and drug discovery and the rising concept of personalized medicine are predicted to enhance the growth of the market in the near future. On the other hand, the low benefit cost ratio and the high capital investment are projected to restrict the growth of the market in the coming years. Nonetheless, the increasing number of opportunities in developing economies and the companion diagnostics are projected to support the growth of the global cancer biomarkers market in the coming few years. The rising research and development activities and the advancements are projected to enhance the growth of the global cancer biomarkers market in the near future. North America and Asia Pacific markets for cancer biomarkers to witness high growth in the next few years.